It is a busy time for professional sports in North America. The race towards the playoffs in Major League Baseball is approaching as we near October. The National Football League just kicked off their season this past weekend. Finally, the National Basketball Association and the National Hockey League seasons are both right around the corner. 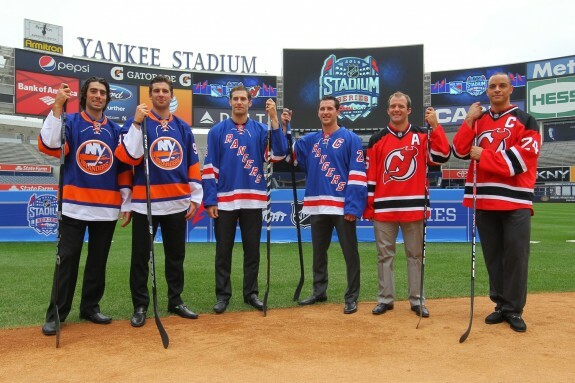 For a brief period of time all four major professional sports will be active, a very exciting time for fans. Now we all have our own opinions over which sport is more “entertaining.” Everyone enjoys different things; some people like faster paced sports with minimal stoppages such as hockey and basketball while others enjoy slower paced sports with numerous stoppages such as football and baseball. In the end we are all correct as each sport has its own uniqueness but that is not what we are talking about in this article. Do not confuse entertainment value with competitiveness. When looking at which of these four leagues is the most competitive one stands above the rest. 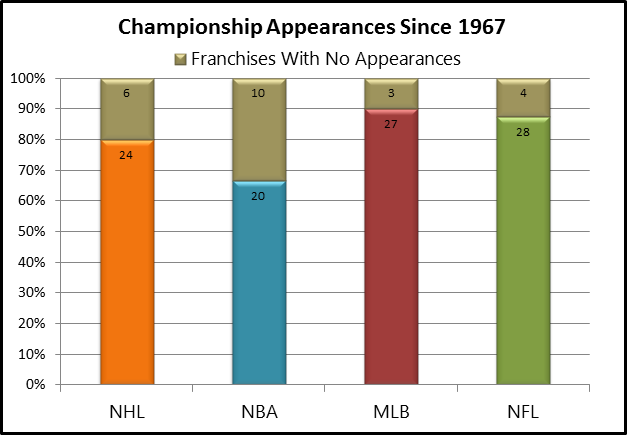 The second part of the definition, “able to compete successfully with others” is the key to differentiating between being provided amusement or “entertainment.” To better compare the different levels of competitiveness between the four leagues let’s first look at the amount of franchises that have won titles in their respective sports. 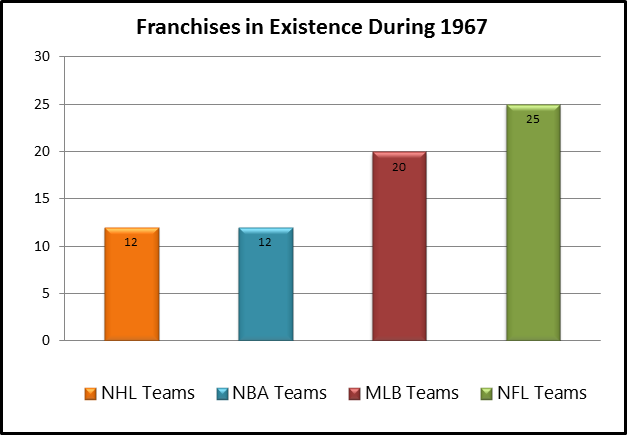 Also because the NHL and MLB are both much older than counterparts we will only include years where all four leagues were in existence. 1967 was the first year that the Super Bowl was played so that will serve as our benchmark. At first glance all four leagues have rather strong parity over the past five decades. Since all four leagues now enjoy at least 30 teams, it is nice to see that at least half have had their day in the sun. 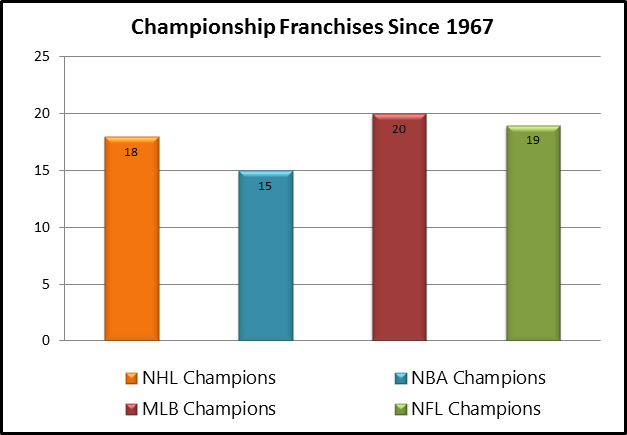 Still this chart ignores a lot of factors such as the total amount of teams in existence today, the amount of franchises during 1967, and the amount of teams that have at least appeared in a Championship. Let’s dive a little deeper and see how the distribution changes when we compare these other factors throughout the four major sports. Looking at the same chart from a different perspective shows us that baseball still tops the chart but now the NHL is second on the list at 60% while the NFL is at 59%. It is also worth noting the small but significant difference seen in the NBA as only half the teams have won Championships since 1967 leaving them nearly 10% behind the NFL. When looking at teams who simply make it to the Championship both the NFL and MLB lead the way. Still these numbers are very misleading when you look at the next graph. In 1967, both the NHL and NBA only had twelve teams in the league while their counterparts had a far greater number. This creates a huge inaccuracy in our data because of the unequal treatment given to the other leagues. Because of this error the larger leagues were far more likely to have different Championship teams due to a larger sample size. 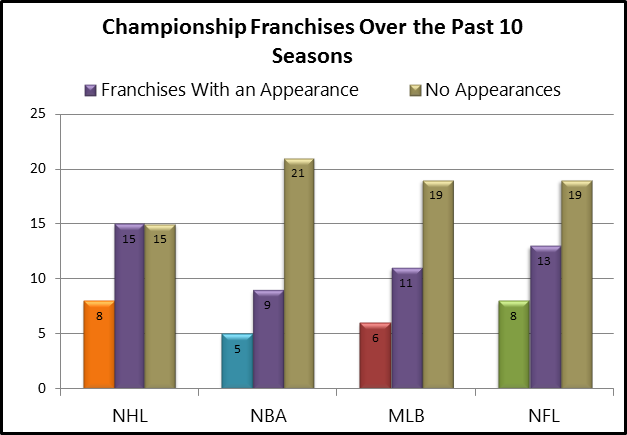 Though the NBA and NHL both have 30 teams today, both were expanding up through the nineties. Since 1980 the NHL has added nine teams and the NBA has added eight teams. Meanwhile, MLB has only added five teams and the NFL added four. The only way we can truly look at what league has the most parity, the most chance, the most competitiveness is to compare the last ten seasons in all four major sports. The reason for this is because no league has added any teams since 2002 giving us both an equal amount of teams and equal amount of years. So let’s look at the most recent ten seasons for the four major sports in North America. Now we can see the nature of the four major sports in North America. The NBA is still stuck at the bottom, and throughout all of these different viewpoints can be viewed as the least competitive among the four. Concurrently, MLB dropped from being at the top in the earlier charts to being only slightly more competitive than the NBA. Both the NHL and NFL top this chart but the NHL holds the advantage of having more teams reach the Championship while the NFL suffers due to having more teams. There are other ways to analyze competitiveness across the sports such as playoff droughts but due to the fact that there are different playoff structures it would again create a large error in the data. 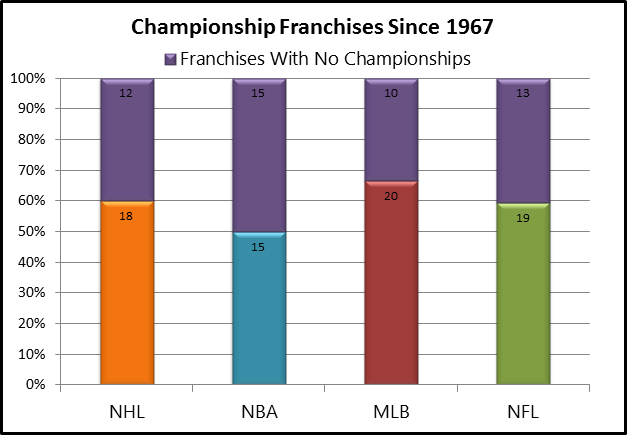 Until recently MLB only had eight playoff teams and the NFL still has six while their counterparts have sixteen apiece. It only makes sense that the leagues with less playoff teams are more likely to have longer droughts. While the NHL and NBA only have a combined one team with a drought of ten years or more the NFL and MLB have seven combined. To reiterate, using playoff droughts would not be a fair assessment because of the differences in playoff structures. With the amount of data we can use to be fair both to league size, and league age it is clear that the NHL has the edge when it comes to competitiveness. It is also worth noting that while the NBA continues to endure dynasties there has been a steady rise in parity in the NHL. This has coincided with record revenues, groundbreaking television deals and a growing fan base that will continue to challenge the more popular sports. It is not a clear cut advantage but the NHL can claim that it is the most competitive professional sport in North America today, eat your heart out Stephen A. Smith.